This fish and salad combination has it all – sweet, sour, savory and rich. 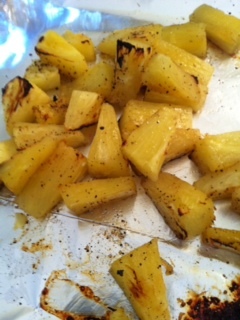 Broiling the pineapple mellows it nicely – I have seen it used in a few Cuban inspired salads and thought I might give it a try. 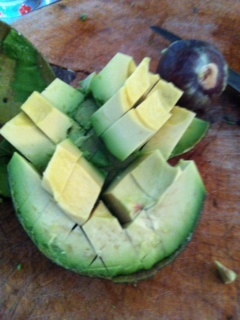 Much of this recipe can be done ahead, just sauté the fish and dress the salad last minute. 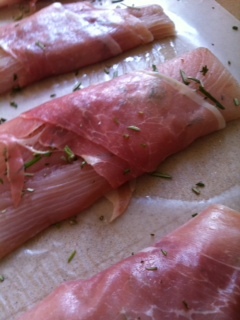 You can also wrap boneless chicken breasts or shrimp with prosciutto to mix it up as a variation. 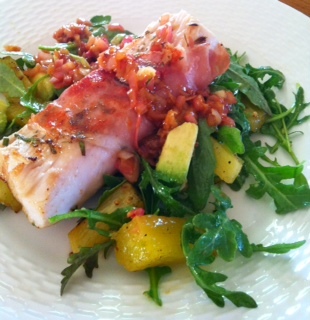 This entry was posted in Recipes and tagged arugula, avocado, Fish, mahi-mahi, Pineapple, prosciutto, salads. Bookmark the permalink.